John Delaney’s annual UEFA Executive Committee salary of €160,000 is supplemented by a €300 a day expense payment when on duty, a UEFA spokesman has confirmed. The UEFA payments are seperate to his FAI salary, which was €360,000 per annum when he was CEO but has been reported as dropping to €120,000 since his recent move to an Executive Vice President role within the national association. Mr Delaney was elected to the UEFA executive committee in 2017 — a position only open to those who hold an active office with their membership association with the positions of President, Vice President, General Secretary or CEO, according to the UEFA website. 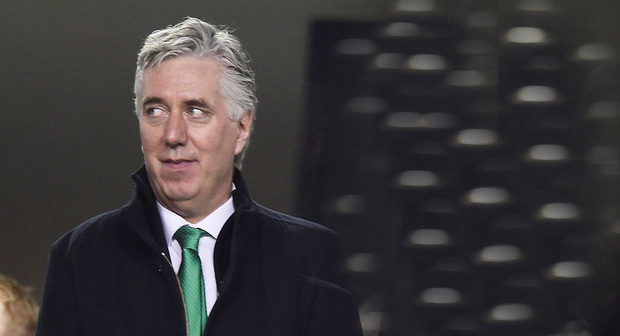 The FAI stated two weeks ago that his 2018 UEFA salary will be donated to the association but UEFA have said there are other perks with the role. “Executive committee members receive a daily allowance of €300 when on duty,” a UEFA spokesman told the Sunday Independent. These duties include attending meetings at UEFA’s Swiss headquarters in Nyon. Generally, UEFA said, these take place every second month. However, they are increasingly organised to coincide with important football fixtures which the executives attend. This comes at no cost to the committee members. “Transport and accommodation are organised by the UEFA administration and depend on the event location. UEFA reimburses a business class seat on a commercial flight when members of the executive committee book this themselves,” said the spokesman. For further details, see today’s Sunday Independent.